Sometimes you bump into a remake that has quality and love written all over it. Trolls and Tribulations: Omega is such a PC remake! Warlock Entertainment has delivered an excellent job with this Windows Remake of the 1984 classic. They upgraded graphics, added features like CRT scanlines to really add to the feeling of the old days. But they didn't change the original ending, thank god! Trolls and Tribulations is a platform game that has puzzle and action into it as well. You start the game by killing the cretins, who do remind me of the eighties Aliens monster, do you notice it too? Especially because when shot, they turn into eggs being the scariest sight ever in the movie. But that aside, when they're all defeated you can start collecting keys and opening doors, like in many maze games, in order to solve the maze and find the end-boss. 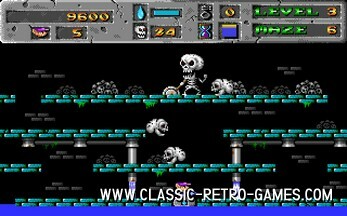 In 1984 this game was released for Commodore64, Atari and Apple II. It was designed by Jimmy Huey who in a fact was also a programmer for Pac-Man, how about that? While we normally mirror games (by permission), we now link to the download page of Warlock Entertainment. This is because you can and should donate on their download page. 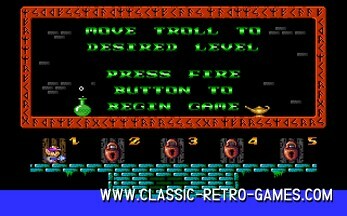 Have fun with this Windows PC version of Trolls and Tribulations. Currently rated: 4 / 5 stars by 12 gamers.